This summer… A coming of age story…One woman will give everything she has…To play the instrument she loves… A journey of passion and skill…A hero like no other…Coming to a music venue near you. Well, anyway, that was the kind of script I had imagined for a movie about this week’s featured drummer, she’s the kind of epic character that makes you think in cinematic terms. But when asked what the narrator’s deep, dramatic voice would say, she replied, “I’m guessing it would be something like, Stephanie Williams starring in Pretty Good, For A Chick.” She’s funny like that, and humble. Perhaps too humble. This week we chat with one of Kansas City’s most talented (and nicest) drummers. The Deli: How did you get to be such a fantastic drummer? Stephanie Williams: Thanks for the kind words! I started when I was 12, and I guess I play the way I do because of my passion for the instrument. I would spend every minute of the day drumming if I could. I've had some excellent teachers (Dave Jarman, Kent Rausch, Mike Sekelsky), but most of my playing is a result of marching bands and jazz ensembles, as well as all of the great local and touring drummers that I’ve played with. I take something from every player I hear, and I think this helps my sound reflect a lot of different styles and techniques. The Deli: How do you approach drumming? SW: When someone comes to me with a riff or a song, my first step is to come up with a feel that makes it groove. Later, I’ll add in fills and expand on the original idea. I have to be interested in what I’m playing, and my main goal is to create parts in a way that would allow any given performance to be recorded and released to the public. I’m all about structure and consistency, but I also like to keep things fun. The Deli: What's going on in your head when you're playing? SW: When I’m drumming, there's nothing else in the world I'd rather be doing. It’s hard to explain what’s happening in my head because it seems like I go somewhere else. I listen to the music, and my arms and legs pretty much take over. I’m not typically a counter. I read music and understand the theory behind rhythm and time, but my playing comes entirely from what the music makes me feel. Sometimes I’ll “wake up” and realize that I’m on stage. 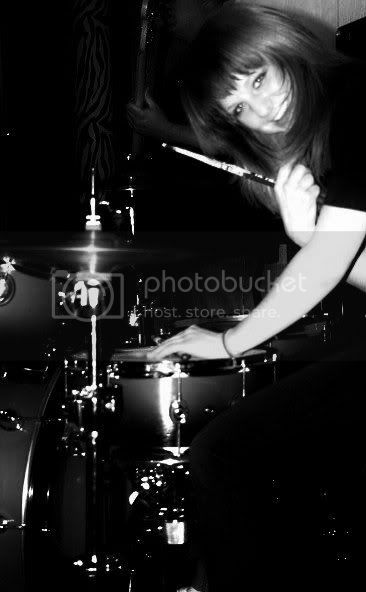 I guess drumming is my happy place. The Deli: Okay, but you're also a great bassist. What's that like? SW: I love the bass. Always have. As a bassist, I still get to work with rhythms and grooves, yet it gives me a chance to try something new and more challenging. I've found that performing on bass offers a bit of nervousness (the good kind) that I don’t experience while drumming. Joining The Cave Girls just sort of happened after a drum jam one day, and it’s one of the most exciting groups I’ve been a part of. I am a drummer though, and there is something about hitting things with sticks and driving a band that is irreplaceable. The Deli: What are your bands and projects right now? SW: I’m playing with The Prolific, The Cave Girls, The Clementines, Claire & the Crowded Stage, and Adam Evolving. I also play every night at Worlds of Fun, and I record and perform with a number of other artists on the side. I’m just fortunate to know a lot of talented people. The Deli: Holy cannoli! You must really love the KC music scene. SW: The music crowd here feels like a big family, and everyone is very supportive of each other. I’ve made so many friends within the community, and the coolest part is that all of them are insanely talented. Does that leave you time for anything else? SW: I spend my time away from music teaching special needs students and working toward a master’s degree in counseling. Most of my free time is spent going to friends’ shows, being with family, trying new wines, and wasting time on Netflix. Also, I have a ton of fun with special effects makeup, and I’ve spent the past 2 years creating the monsters at Worlds of Fun Halloween Haunt. Catch Stephanie’s blockbuster skills in action Thursdays through Tuesdays at Worlds of Fun through the end of July and see her perform with The Cave Girls at Angels Rock Bar, July 25. Sergio is a drummer drone for The Hillary Watts Riot and a contraption set buffoon with Alacartoona. He wishes he could get paid to practice meditation, do yoga, and drink white tea all day long. But in the meantime he earns his keep making greeting cards in Spanish.